Bangkok’s next subway line elegantly blends Thai traditional design and neo-classical European architectural influences. Expect to see awe-inspiring interiors not just above ground, but underground as well. When they debut, the four subway stations of Bangkok’s MRT Blue Line extension – from Hua Lamphong to Bang Khae – will reflect a classic charm to their design while referencing significant flourishes in history. Captivating events inspired the MRT station’s interior, reflecting each area’s diversity and cultural stories. The Sanam Chai station will be a tasteful showcase of traditional Thai art conceptualised by Professor Dr. Pinyo Suwankiri, Thailand’s National Artist in the Visual Arts, esteemed for his expertise in Thai architecture, traditional pattern drawing and woodcarving. Having been selected by contractor CH. Karnchang, his vision is seen in the now completed interior of MRT Sanam Chai. Inspired by the desire to preserve the majestic heritage of Thai architecture, Dr. Pinyo tastefully highlights elaborate Thai art and culture while underlining the spectacular architectural lines that future generations can appreciate. As a result, the MRT’s Sanam Chai station is a one-of-a-kind masterpiece. The station’s main highlight is located on the ticketing floor, just before patrons descend to the platform level. Resembling an ancient royal court hall, this part of the station will feel familiar from history books, while commuters also experience a visit to the magnificent Grand Palace outside. 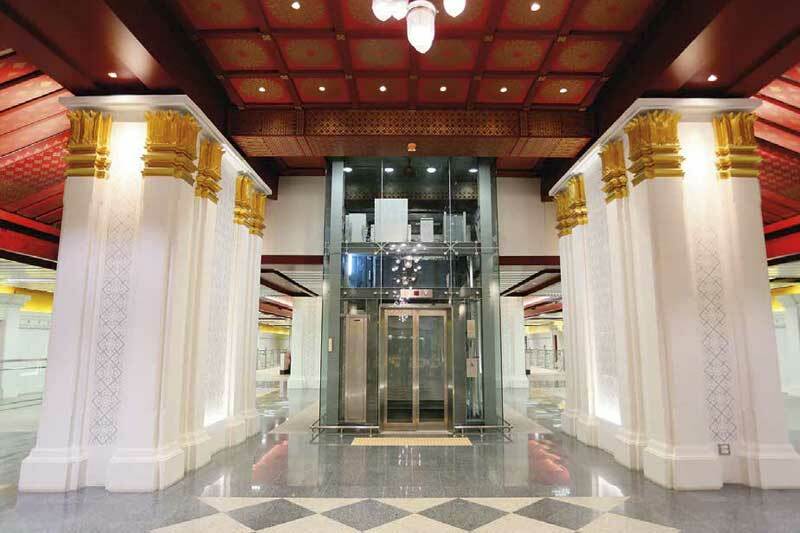 MRT Sanam Chai’s imitated royal court interior is elaborately decorated with ancient-style columns adorned with exquisite bullet wood flower tile patterns. Lotus-shaped decorations in gold plate are above each column, all of which from floor to ceiling visualises an ancient city gate. Another spectacular sight is the ceilings decorative carved pattern known as Dao Lom Duean, meaning “Moon Encircled with Stars.” Lavishly ornamented, the pattern is a sight to behold with a mesmerizing use of white, gold, and crimson as the setting and gold leaf plate covering the patterns. Already, the Sanam Chai line hears praise as Thailand’s most beautiful subway station. One interesting aspect of this MRT station in this historically-rich area of Bangkok are the archaeological discoveries during its construction. Site excavations uncovered an underground foundation of a former palace that could date back to the early Rattanakosin era. Further research revealed that the area was once the location of the residence of His Royal Highness Prince Adisorn Udomdej. Many artefacts like pearl shells, intact horses’ bones, and glazed clay items were unearthed. To acknowledge such valuable discoveries, space outside the station has been dedicated to the historical finds, as curated by Museum Siam. MRT Sanam Chai Station is located at the junction between Sanam Chai and Phra Phiphit Road, and Sanam Chai and Rachini Road, Phra Borom Maha Ratchawang Sub-District. It is set to open in December 2019.